This line graph interactive activity set is one of eight other sets in the Line Graphs Interactive Collection aligned to Common Core Standards. 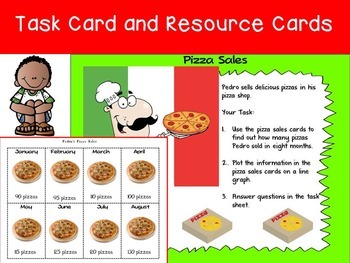 Cut, laminate and place the set of visual cards in a zip-lock bag together with the activity sheet, task card and line graph templates in file folder for use in math rotation groups and/or independent centers. and 127 pages 'Line Plots and Line Graphs Ultimate' collection.